Many places in the world are shrouded in legend. 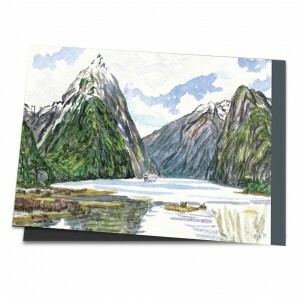 This is certainly true of Milford Sound, which lies in the Fiordland region on the South Island of New Zealand. According to an old Maori legend, it is God's creative masterpiece. The legend tells how the Devil appeared the moment this miracle was complete and created the sandflies, little tormentors to force us humans to experience the pain instead of the beauty of life. Sandflies are flying insects, infinitesimally small, and aggressive biters – and now I had to confront them on their home turf. So, in spite of the summer temperatures, I equipped myself as if for a Polar expedition: gloves, scarf, hat, trouser legs tucked into the shoes, jacket tightened at the wrists, face and right hand practically soaked in anti-insect lotion. Wrapped up in this way I sat on the water's edge, enjoying the location's impressive unspoilt nature and, while that great swarm of biting black monsters buzzed about me, I painted God’s masterpiece of New Zealand with complete peace of mind.